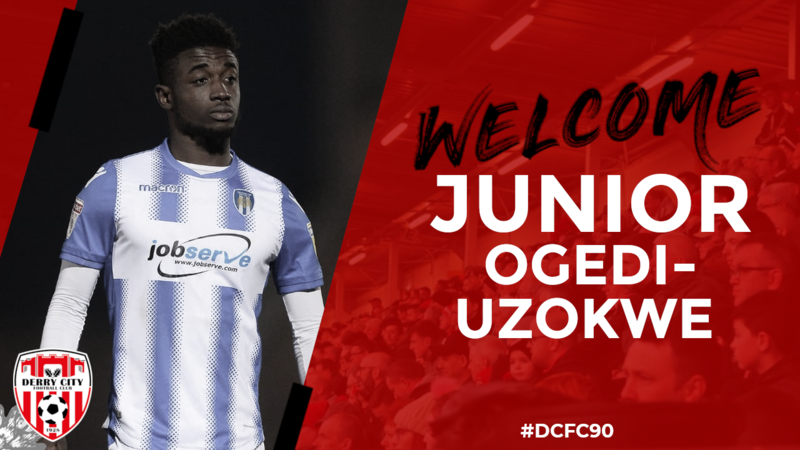 City have signed Junior Ogedi-Uzokwe on loan from Colchester United. The forward, who bagged himself two goals for the Candystripes in Tuesday’s friendly win at Ballinamallard, joins from the League Two side on a 6-month loan deal. The 24-year-old started his career in non-leagues in UK, before a spell in Turkish North Cyprus. A return to the UK and a prolific 2017 season where he bagged 34 goals in 34 games for Maldon & Tiptree saw him earn a move to Colchester. He has found his time with the Us limited and went on loan to Bromley, scoring 6 times in 25 games there. He has been training with the Candystripes in recent weeks and was part of the squad that travelled for the training camp to the Isle of Man. Derry City Football Club would like to thank Colchester United for their help in completing this deal.